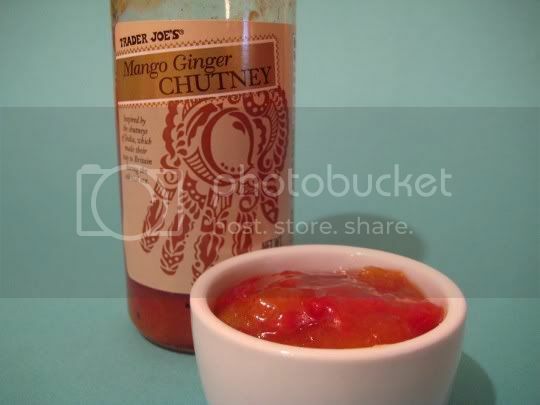 Oh, how I love chutney...and this stuff is simply wonderful! The flavors in this bargain buy are so strong and powerful, you'd think this was some expensive imported brand. Fruity, sour, tangy, and surprisingly spicy...so you may want to use this as a condiment for milder dishes. Big chunks of mango are strewn with bits of red pepper and golden raisins, all in an ultra sweet and tangy sauce. The ginger comes through, but not as much as the tanginess that is the red wine vinegar ingredient. Your taste buds will go crazy with the melange of flavors! Serve with Indian or Asian dishes, or maybe even spread on toast for a very unique treat. What did you eat it with? Actually, with the Thai Rice Pancakes (featured a few posts down). But I would definitely pair it with anything Indian: samosas, naan, curries, etc. And if you're feeling really adventurous, this would be great as sort of a savory-sweet jelly (like pepper jelly, if you're a fan of that), spread on toast with cream cheese!